Yo ho ho! Captain Jack Sparrow (Johnny Depp) is back on Blu-ray and now Disney Movie Rewards has a pirates' booty for you! 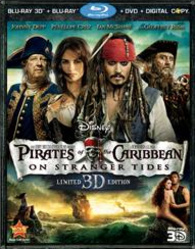 Disney has released another coupon offer this time to save $5 on 'Pirates of the Caribbean: On Stranger Tides - 3D' Blu-ray available this week! From Disney and producer Jerry Bruckheimer comes all the fun, epic adventure and humor that ignited the original. Johnny Depp returns as Captain Jack Sparrow in Pirates Of The Caribbean: On Stranger Tides. A tale of truth, betrayal, youth, demise — and mermaids! When Jack crosses paths with a woman from his past (Penélope Cruz), he’s not sure if it’s love or if she’s a ruthless con artist using him to find the fabled Fountain of Youth. Forced aboard the ship of the most feared pirate ever, Jack doesn’t know who to fear more —Blackbeard (Ian McShane) or the woman from his past. Directed by Rob Marshall, it’s filled with eye-popping battle scenes, mystery and all-out wit. Simply visit this page to print out your coupon from the Disney Movie Rewards website. This coupon is valid in the United States and Canada only and the offer expires October 23.